These sign supplies make creating a suspended signage system easy! Why should your company stress out about creating the ideal formation of suspended signs for your store? With these sign supplies, also known as architectural signs, all of the parts needed for a complete display are included in one convenient kit. The suspended signs for ceilings feature a wide variety of arrangements. You have the benefit of choosing from two (2) larger poster frames in one kit, all the way up to twenty-four (24) smaller sign supplies in one set, with many different variants in between there. Sign systems, suspended signs allow you to communicate large amounts of information quickly and easily. Window advertisement is one of the most effective ways to draw customers into your store, and these ceiling displays will allow you to take advantage of that. By utilizing these sign supplies in a window display, you can showcase the specials and products offered inside the establishment to passersby with a mere glance. What materials make up the suspended sign kits? 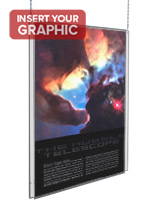 Acrylic frames in a selection of sizes: 18" x 24", and 22" x 28"
The included chains are more affordable than steel wire, allowing us to keep the price point down on the overall kits. The metal chains are also very longstanding and designed not to snap, so you are still getting a strong display with the chains. Utilizing acrylic frames instead of conventional wood or metal in these displays is another way that we're able to keep the prices low on these kits. However, price isn't the only reason we decided to use acrylic for the frames in these systems. What are the benefits of using acrylic frames with these hanging systems? The acrylic used in these frames is precision laser cut, which provides some of the cleanest lines around. The frames are formulated from 1/8" sheets of acrylic that have been folded over. 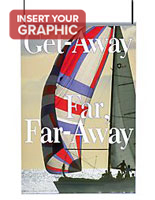 The resultant design is easy to load up with images and keeps your images secure thanks to a top-loading slot. The poster holders option clear acrylic instead of a colored style. The transparency of the frames provides a modern and stylish, yet neutral look that does not distract from the messages that the signage is conveying. The transparent frames also allow you to create a dual-sided exhibit, letting you advertise in two directions at once. The acrylic construction of the frames is much lighter than ones made from wood or metal. This means that attaching the frames overhead is an easy feat that one person can accomplish quickly. The one limitation with these acrylic signs is that they are not waterproof, and therefore should be used indoors only. But when this system is utilized in the front windows of stores and businesses that's not an issue. Hanging one of these architectural sign displays in the front window provides a number of benefits. You'll be able to reach passersby on the street, while the back sides of the frames could continue advertising to customers inside the establishment. The clear acrylic frames will hold your images securely and not block the view to the inside of the store, which is another way to entice passersby inside. Of course, front windows aren't the only places that these architectural sign kits can be used. 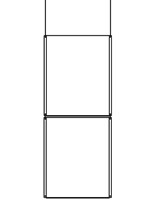 They can often be found in supermarkets and drugstores as aisle markers, swinging above to let customers know which goods are located where. The hanging displays also work well to create wayfinding systems, especially in larger, multi-story buildings. Hotels, banks, and other agencies that provide services like to use these frames as a wall showcase behind a customer service desk to provide information about products available or locations of interest where visitors may like to go. Many stores that want to work posters into their advertising schemes while not taking up too much floor space like this hanging signage because it hooks into the ceiling instead of taking up valuable wall space. Each kit comes with a varied number of frames in there: 3 pcs, 4 pcs, 6 pcs, 8 pcs, and many more. 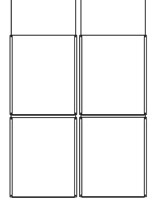 These are usually arranged in sets of 1 column, 2 column, 3 column, 4 column, 6 column, and other showcases. If you order one of these kits and find that you need a couple more frames or want to add a different sized poster holder into the mix, you've got plenty of options for expansion! You could order another similar set to link up to the existing one. The sleek look provided by the acrylic frames will provide a consistent look across your display, which will help the exhibit blend together seamlessly. Or, you could also order individual pieces and hardware kits on this website. Every piece that's included in these kits is available for purchase singly, so if you need just one extra 11" x 17" vertically oriented frame, you can pick that up. Our hanging hardware kits have the same hardware as in the signage system, but can be bought with either chains or monofilament lines and come in a variety of lengths.